After a relative peaceful opening day of the Sabarimala temple yesterday, tension prevailed at the hilltop shrine on Tuesday as a woman managed to reach the holy steps of the hill shrine. The devotees surrounded the woman and accused her of being in the “barred age group” of 10 to 50, but police claimed she was 52 years old. However, they stopped protest after she furnished documents to prove her claim. The woman devotee has been identified as one Lalitha, w/o Ravi, from Tirur in Thrissur district of Kerala. Lalitha’s presence saw devotees sit on the sacred eighteen steps in protest. It may be noted that the eighteen steps cannot be climbed without Irumudi kettu. Even after it was confirmed that Lalitha was above 50, the mob was reluctant to disperse. 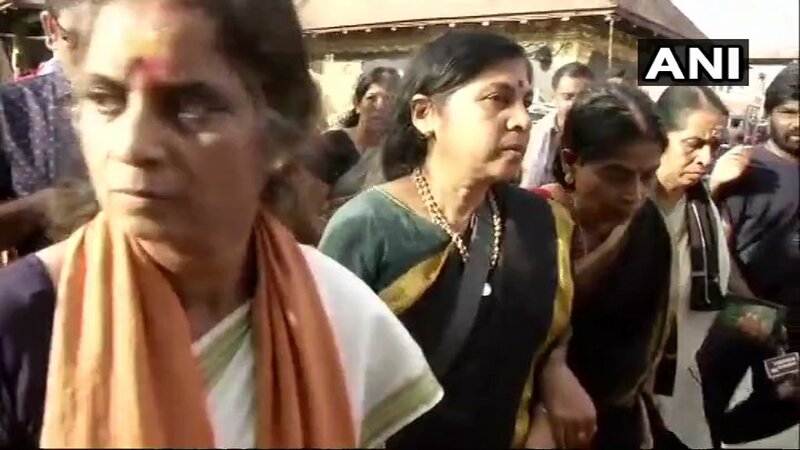 Later, some women BJP leaders escorted her to Sannidhanam. Lalita was told that the protest is not against her presence but against the LDF government which was trying to destroy Sabarimala. “The police and chief minister Pinarayi Vijayan are behind the havoc in Sabarimala. Devotees are pained at the high-handedness of police who are trying to make women enter Sannidhanam at any cost. This is highly deplorable and BJP protests against the police acting like CPM goons in Sabarimala,” a BJP leader said. A devotee form Andhra, Vijayalakshmi from Guntur was also blocked from entering the shrine citing that she had now worn the Mala. However, Vijayalakshmi said that she is more than 55 years old and that before the Supreme Court verdict she had come to Sabarimala. “Before the SC verdict women above the restricted age group had no problems to come and have darshan here,” she said. The doors to Ayyappa temple opened on Monday for the second time in three weeks for a two-day special puja amid unprecedented security over apprehension of protests by those opposing the Supreme Court order allowing women of all age groups into the shrine.